This past December, speculation and rumours were finally put to rest as Bermuda was officially announced as the host of the 35th America's Cup, taking place in December 2017. Much earlier in 2014, when Bermuda was mooted as one of four venues for the 2017 America’s Cup, there can’t have been many neutral observers who seriously believed that this little island, more than 600 miles off the Atlantic coast of the US, would beat Chicago, San Diego and Newport, Rhode Island, to the punch in a Cup that is being defended by the US team. With so many viable ports on the mainland US to host the America’s Cup, why go offshore? For an event that aspires to be one of sport’s great trophies – and is indeed the oldest trophy in international sport – it seemed about as mad-capped as Oracle Team USA owner Larry Ellison’s idea of holding the America’s Cup in Hawaii. But at least Hawaii is in the United States of America (not to mention Larry bought an island there, which is featured in the February issue of Boat International) Still, here we are. Bermuda becomes only the sixth country to host the world’s oldest sporting trophy, along with Great Britain (back in 1851), and in more recent years the US, Australia, New Zealand and Spain. Chicago and Newport fell out of contention earlier in 2014, and Oracle Team USA CEO Russell Coutts and his recently appointed Commercial Commissioner Harvey Schiller won’t be drawn on the specifics of why San Diego failed to get the nod ahead of the British Overseas Territory. So we have to draw our conclusions based on why Bermuda did win the bid. 1: Bermuda has the space for teams to be based side-by-side, creating a "Cup Village buzz"
Coutts is excited that Bermuda affords the prospect of all six America’s Cup teams – and at the last press conference in New York, Schiller mentioned the possibility of two more – having their team bases situated side-by-side together. The last time we saw this was Valencia 2007, when the presence of 11 teams all in one spot really did create a special "Cup Village buzz". The same thing was meant to happen in San Francisco, but it never did because waterfront property close to the city was too hard to come by. When the America’s Cup was twice hosted in San Diego in the early 1990s, the teams were scattered around different parts of the city and most locals were scarcely aware the event was going on. Coutts says that finding a central location in San Diego would have been a struggle. Bermuda solves that problem. The idea of a "pit lane" where fans get up close and personal with the teams implies the live spectator experience remains important to Coutts’ vision for the America’s Cup. That was one of the great appeals of San Francisco with its proximity to the city and the natural amphitheatre of the Bay. However, buying a plane ticket and finding hotel accommodation (which currently is in short supply and expensive) is going to take some serious commitment from an America’s Cup enthusiast. More hotels are set to be built before 2017, not least by Hollywood power couple Michael Douglas and Catherine Zeta-Jones, who added some glamour to the front row of the New York press conference. But however much additional accommodation is built in the next two and a half years, it’s hard to see how Bermuda is going to attract anything other than the committed America’s Cup enthusiast, and the chances to convert new fans are certainly slimmer. Coutts' mission to commercialise the America’s Cup, and attract a broader and younger audience, has also been cited in the move to racing on the high-speed hydrofoiling multihulls. The "extreme" boats promise more excitement for viewers, not just for the high speeds they reach and daring manoeuvres they make, but for the sheer ability to race quite close to shore. But how crowded will the shoreline be in Bermuda compared to, say, San Francisco or another US city? For those who do make the pilgrimage to witness the live action of the America’s Cup, they certainly can expect to watch some thrilling racing inside Bermuda’s Great Sound. Sailing on board a 40-knot AC62 foiling multihull, the Great Sound is going to seem mighty small. Coutts raised the idea of reducing the size further (bearing in mind the AC62 is already 10 feet shorter than the 2013-vintage AC72s), but the Challenger teams rejected this proposal. So the course will be tight, although it would have been even more so in San Diego. In pure sailing terms, San Diego never had much to offer. The wind is predominantly light, it would have been a real squeeze to run the racing inside San Diego Bay, and out to sea would have been no good for spectating, never mind the predominance of kelp that causes real problems for slower, conventional sailing boats, let alone hydrofoiling multihulls. However, the weather in Bermuda should be spectacular, with a great year-round climate (although San Diego has that, too), and a broad range of wind conditions. The America’s Cup sailors seem genuinely excited about training and racing there, with most of the skippers having raced a number of times at the Argo Group Gold Cup, one of the most prestigious match racing events on the circuit and part of the Alpari World Match Racing Tour. We shouldn’t forget that the island sits on the northern apex of the Bermuda Triangle, notorious for the mysterious disappearance of ships and planes, although this doesn’t seem to deter yachtsmen from competing in the biennial Newport Bermuda Race, which has been going since 1906. 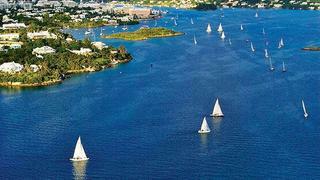 The maritime history and the Bermudians’ love of sailing could count for a lot. The island’s Premier, Michael Dunkley, said everyone could expect a warm welcome, and I believe him. The other big difference between San Diego and Bermuda is that only one of them is an offshore tax haven. While Coutts denies this was a consideration in the bid process, it’s hard to imagine it didn’t have some part to play. Taking the America's Cup away from mainland US, putting it on a remote island in the Atlantic, in many ways the Cup appears to be returning to its elitist roots, an acknowledgement that despite the best intentions of recent times, it is nigh on impossible to commercialise the America’s Cup. The last four editions have been won by billionaires. All things considered, Bermuda seems a fitting venue for such an exclusive event.